From A Method of Breaking Horses and Teaching Soldiers to Ride, by Henry Herbert, The 10th Earl of Pembroke. Whether for self-improvement or out of self-preservation, we riders are usually enthusiastic readers of books about our favourite sport. We pore over dressage tests and deconstruct the authoritative guide to every movement, hoping to discover ways to maximum the mark for each. We carefully investigate the latest wisdom from Ingrid Klimke, Blyth Tait, Jimmy Wofford, and other expert riders to learn how they make the most of every ride, every day. We even study the rule books (grudgingly) to avoid a dim-witted elimination or disqualification. Now, Professor Charles Caramello has teamed up with Xenophon Press to pair Pembroke and Tyndale for modern riders. In this single approachable volume he offers readers new insights into 18th-century equitation and its timeless application. Military Equitation: or, A Method of Breaking Horses, and Teaching Soldiers to Ride, by Henry Herbert, Earl of Pembroke, and A Treatise on Military Equitation, by William Tyndale. Ed. Charles Caramello. Frankstown, VA (USA): Xenophon Press, 2018. RRP $US40. Available from Xenopon Press or Amazon. Henry Herbert, 10th Earl of Pembroke (1734–94), happily declared that he had been “horse mad” from a very young age. It’s not surprising, then, that he asserts that good training exhibits patience and restraint and is grounded in quality horsemanship that employs sound theory and correct principles. Pembroke also offered strong opinions on such diverse equestrian issues of the day as proper bitting, effective saddlery, the correct cut-length for forage feeds, and safe fitting of halters. William Tyndale’s birth date may be uncertain, but his service as a major in the 1st Life Guards (1794) and two years later as a brevet lieutenant, places him almost a generation later than Pembroke’s in the continuum of classical equitation and training. Tyndale promoted reason, patience, and simplicity as vital elements in developing the kind of horse any of us might wish to ride. Interestingly, like American cavalry officer George B. McClellan, Tyndale also proposed a redesign of his military’s standard trooper’s saddle to improve utility, performance, and horse comfort. So what can you expect to discover by reading Pembroke and Tyndale? The living art of horsemanship, most particularly for eventers, is founded on proven principles tested and refined by British and European light-horse cavalry units. Riders in the 1700s strove to master suppleness, shoulder-in, and lateral work much as we do. Balancing work on the longe, work in hand, work in the open, and work in the defined/enclosed arena varies for each horse and changes as the horse matures in its training. The horse, its condition, and its soundness will define the type and duration of the work needed to best advance the horse’s educational progress. From William Tyndale’s A Treatise on Military Equitation. A list of works cited in the explanatory notes accompanies each text. These specific bibliographies are a rich lode waiting to be mined by serious students of the equestrian arts. The introduction also mentions more than a dozen influential historical titles. The texts are presented in facsimile, with the original plates. The 17 plates for Pembroke are inserted at the end of the text, and the 5 plates for Tyndale within the text. Modern readers should expect a brief “break-in” period while adjusting to the conventions of 18th-century English writers. Yes, it quickly gets easier! The book has illustrated cover, so a dust jacket is not included. A folded sheet of greaseproof paper or a large plastic food-storage bag will protect the book if it travels to the stable yard with you. Of course, this is the electronic age. Xenophon Press also offers an ePub edition that mirrors the printed one. Enjoy this new book either way! Alane AIchorn is a US Eventing Association life member who has evented to Prelim, and a US Pony Clubs graduate, life member, and adult riding member. Alane also rides western, and has fun in sidesaddles of both English and Western designs. “So, despite my first love of eventing, I am shamelessly unfaithful to a single equestrian discipline,” she says. Her current mounts are a lovely and classic red-headed Thoroughbred mare who won a bit on the race track, and her devoted sidekick, a smart dappled-gray IDSH who is very green and up for any tack that is tossed on her. Alane is a current USPC Chief Horse Management Judge and have judged all across the US, from the Kentucky Horse Park to Alaska. She is also a Director-at-Large for the Irish Draft Horse Society of North America. 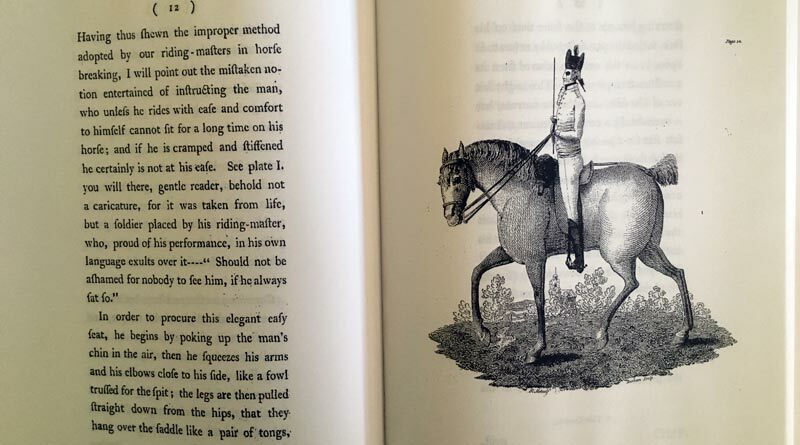 ” I devour books like this one and I appreciate Xenophon Press’s dedication to preserving classical equestrian works, despite the very limited market advantage in doing so. I hope that my fellow riders can enjoy learning from the works of the Riding Masters who preceded us by centuries,” Alane said.